If you ever wanted to give life to your old and boring charts, then Infogr.am is a prefect online service for you! With intuitive interface and powerful tools, everyone can create incredible looking charts that can be used in schools, businesses, private projects, and websites. 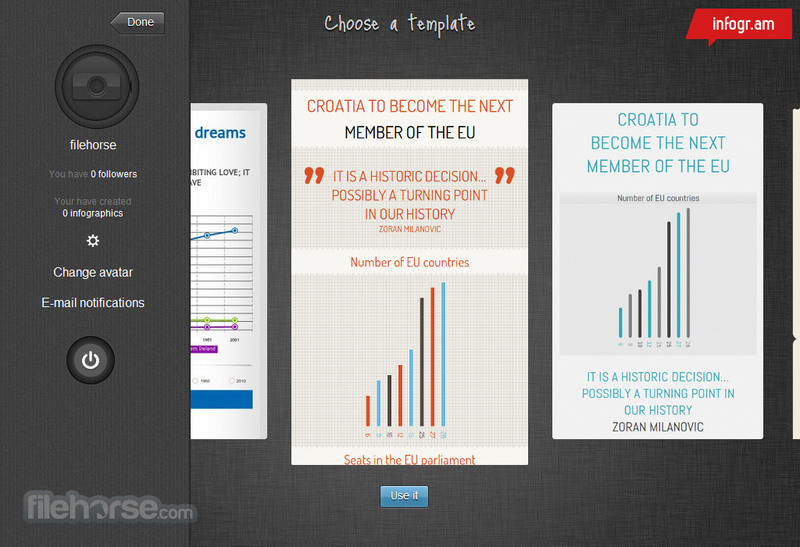 With Infogr.am you don’t need to hire expensive designers, because power that they wield is now only few clicks away. How does Infogram works? You simply upload your chart data from your local XLS or CSV files, pick a design among hundreds available components and themes, and then simply share your infographic creation with others. 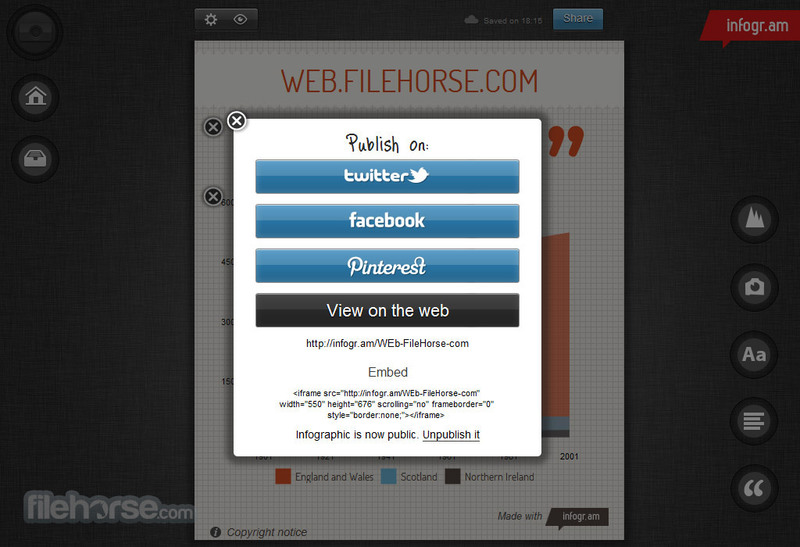 You can share links, or even embed your work on other sites. Today, infographic presentations made with Infogr.am can be seen on some of the best known websites and newspapers around the world. With few clicks of your mouse, your creation can become much more presentable and visually striking. Give it a try. Best place on the web for creation of interactive infographics! There is many ways that you can format your data and make it presentable for the audience of your choice – family, friends, classmates, clients and the entire world. The only thing that you need to ask yourself is what form of presentation you want to use? Video presentations are not suited for everyone, slideshows even less so, and boring text listings will really rarely manage to catch the eye of the random internet user who has managed by chance to find your presentation on the web. But many people agree that infograms, especially interactive ones, represent the one of the rare examples of presentation that will catch the eye of everyone and even force them to test the limits of their interactivity. One of the best services for creating infograms comes from Infogr.am, company that was founded in early 2012 by web developers UldisLeiterts and RaimondsKaze with a goal to enable everyone to quickly craft very attractive and interactive promotional and work-related infograms. Infogr.am is a one of the best places on the web where you can create, modify, download, share and embed infograms in a quick and easy way. With support for all the modern tools for creating visually striking imagery that is relying on your own data, anyone who has few minutes of free time can create eye-catching presentations that can be no only informative and pretty, but also interactive and ready to be used in any situation. This includes personal biographies, school projects, innovativeshowcase of your vacations, marketing campaigns, business road plans, and more. All infograms that are created with Infogr.am feature excel-like data management editor which enables you to fully control your visualized data (support for importing XLS, XLSX and CSV spreadsheet files is present). If you fear that you cannot create unique infograms that won’t be visually distinctive from others, fear not. 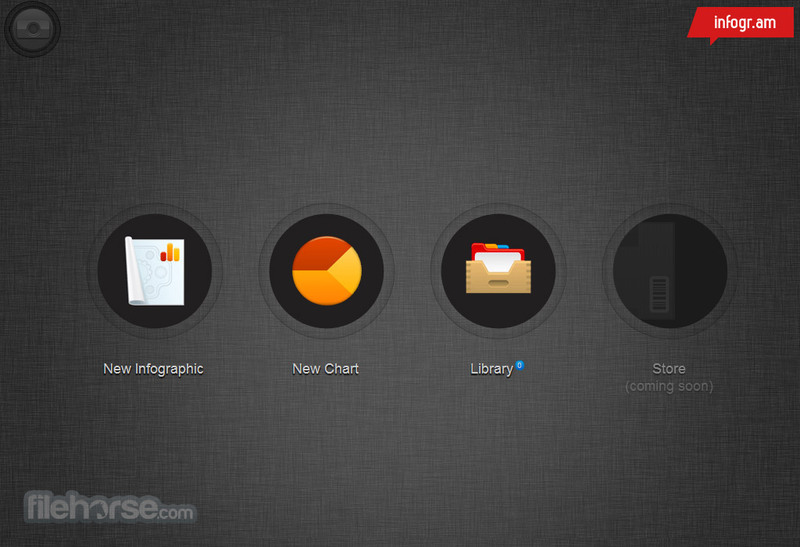 Editor of Infogr.am gives everyone the chance to fully customize their presentations with more than 30 types for charts, covering everything from tree maps to bubble charts. Finished product can be easily downloaded on a local PC storage as PNG or PDF, after which you can manually share them. Internet sharing is much easier, with fully integrated tools for sharing and embedding on Twitter, Facebook, Pinterest and embed code. 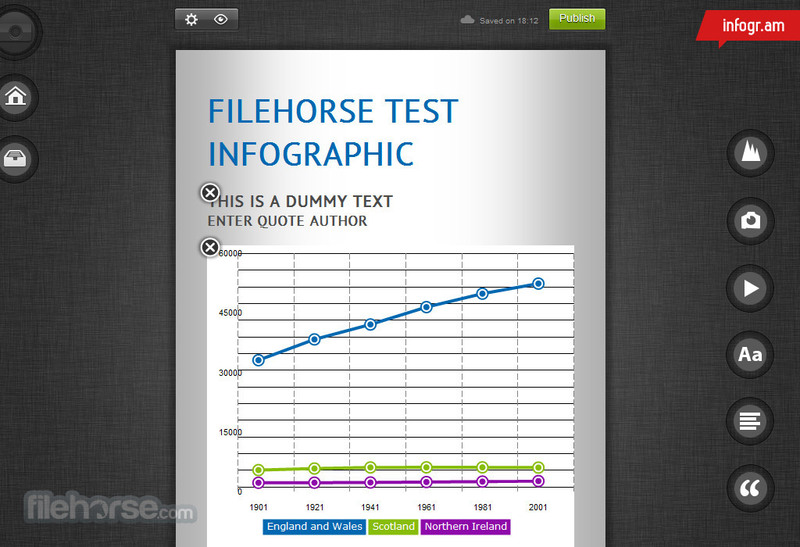 Infograms can also be hosted on Infogr.am website, although you can elect it to be private. As of early 2014, Infogr.am was responsible for creation of more than 1.8 million infograms, with more being added each minute. It would be really strange if website that promoted beautiful infograms would not have good interface and streamlined access to all of its features. Worry not, because Infogr.am is all that it aims to be- simple to use, free, with simple navigation interface, informative main page and easy-to-use user dashboard for infogram creation, management, saving and sharing. 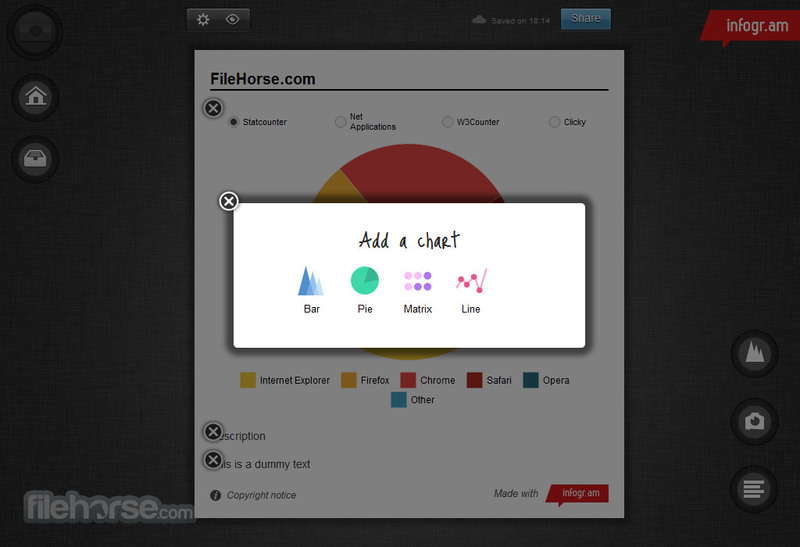 Infogr.am is completely free for use, no matter how much infograms you want to create. New account can be create either manually or by using your old Facebook or Twitter credentials. As of early 2014, Infogr.am was responsible for creation of more than 1.8 million infograms, with more being added each minute. If you visit their website, we are sure that number will immediately start to grow a little faster.